Closely associated with S. Augustine’s were the Community of the Sisters of the Church, founded by Mother Emily Ayckbowm, daughter of the Rector of Holy Trinity, Chester. Miss Ayckbowm had already begun the Church Extension Association to help the poor of her father’s parish. 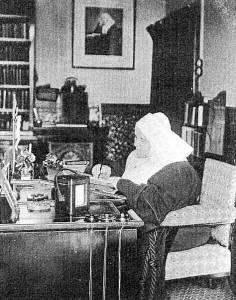 When she came to London she started “Ragged Sunday-Schools” with hot tea and buns for poor children and established catechisms and an embroidery room for helping overseas missions. Leaflets about the Faith and hymn-book for Sunday-Schools began to be published. From the Extension Association grew the Community and Emily was clothed as a novice by Fr Kirkpatrick in 1870. No Anglican community expanded so rapidly. 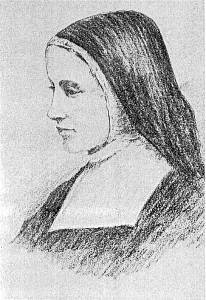 In Kilburn Mother Emily founded and the Sisters staffed S. Augustine’s schools and an orphanage. Schools, orphanages and children’s homes were begun in several London parishes and eventually spread to other parts of the country and the world. The spirit of the Sisters is well expressed by the choice of S. Michael as Patron. The Holy Angels worship and serve God in heaven and minister to God’s people on earth. S. Michael especially is associated with overcoming evil and establishing God’s rule. The Sisters' life was grounded in their daily life of prayer - the Mass, the daily offices, silences and meditation. From their love of God overflowed their caring for God’s people, especially the poor. Mother Emily was prepared to fight any number of battles whenever she came across injustices. After the war the Community moved out to Ham Common. Though much smaller, it still seeks to be faithful to the spirit of Mother Emily.